Experts Bernhardt and Hébert's latest book demonstrates strategies to ensure your entire staff works together to design, implement, monitor, and evaluate a schoolwide prevention system with integrity and fidelity. Each step in this important resource is designed to help administrators, teachers, and other educators improve the learning of every student by implementing Response to Intervention (RtI) as part of a continuous school improvement process. This second edition spotlights the "Five Stages of RtI Implementation" and is complemented by the robust online RtI Implementation Guide, which includes more than 30 downloadable templates, examples, and other files to help schools start their journey of establishing a successful system. By applying the authors' insightful guidance in Response to Intervention (RtI) and Continuous School Improvement (CSI), you'll be able to redesign your general and special education programs to put your school on a path toward improvement! "This book answers questions like ‘who leads RtI?’ and helps educators with very practical aspects of RtI, such as ways to move from a reactive state to a proactive one. With graphic organizers and templates to use as working guides, the 2nd Edition of RtI and CSI is very easy to understand and very reader friendly." 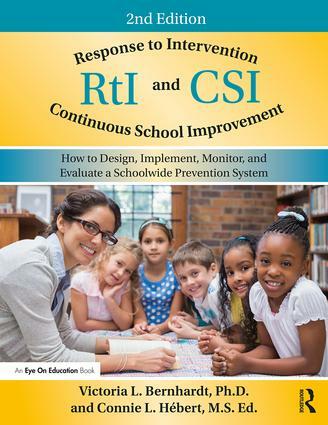 "The 2nd Edition of RtI and CSI, along with the RtI Implementation Guide, will assist campuses and school districts in implementing and evaluating a tiered approach to intervention that will meet the needs of struggling students, and ultimately provide a level of structured supports to prevent inappropriate Special Education placements." "One of the most difficult pieces of creating a strong foundation of understanding and purpose was is to engage teachers/staff in understanding the "whys" before jumping into the "hows". Response to Intervention (RtI) and Continuous School Improvement (CSI) develops the purpose first and creates a more comprehensive, holistic approach so that the "hows" can be more thoughtfully considered and applied." "The additions made to this edition are extremely valuable and will be useful for work with my staff as we continue to refine our RtI system." "I really like the content and tools provided in RtI and CSI. I found these really helpful and am very anxious to be able to share these materials with my schools and schoolwide prevention team as will as with some key leaders at the state level. I believe the tools and approach in this book are greatly needed." How Are We Going to Get to Where We Want to Be? Is What We Are Doing Making a Difference? Is RtI Being Implemented with Integrity and Fidelity? Is Acceptable Progress Being Made? What is the Impact of RtI Implementation? Victoria L. Bernhardt, Ph.D., is Executive Director of Education for the Future Initiative, a not-for-profit organization located at California State University, Chico, California, whose mission is to build the capacity of all learning organizations at all levels to gather, analyze, and use data to continuously improve learning for all students. She is also a Professor (currently on leave) in the College of Communication and Education, at California State University, USA. Connie L. Hébert, M.S. Ed., is an experienced educator and consultant in the field of special education, and a K-12 Intervention Consultant for the Jackson R2 School District in Missouri, USA.